Our local supermarket had some great chocolate chip cookies for sale about two months ago. I bought a packet and have been instructed every week by a certain child to "buy more mum" ever since. Unfortunately they are not there any more and so I have been promising to make them and consistently breaking my promises, mostly because my experience with GF cookies is that they are crumbly and not very nice. Well, blow that excuse out of the water because yesterday I made The Best Choc Chip Cookies ever. They are chewy in the middle and crunchy on the outside - delicious! Here's the (approximate) recipe. 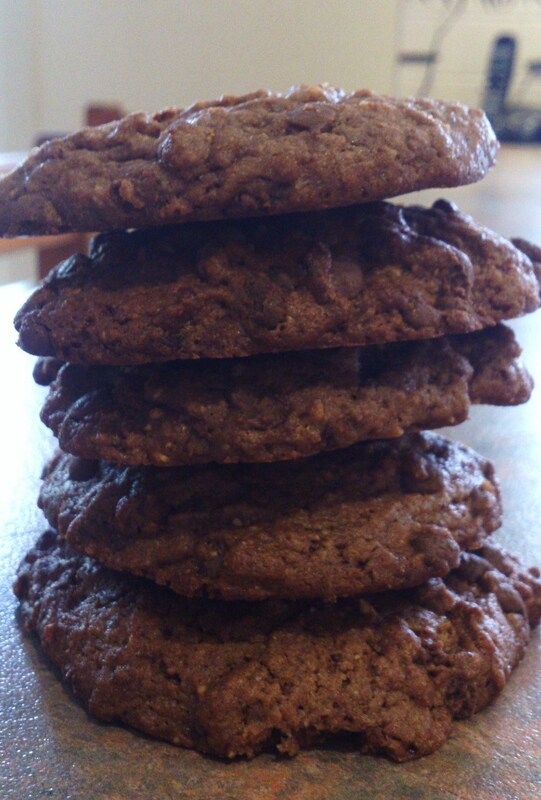 I took a regular cookie recipe from a book I have and added and substituted all over the place, so it was a bit of an experiment. 1.5 cups of brown sugar, lightly packed. Hazelnut meal (or almond meal). I think I put in about half a cup. Mix these together in a bowl. 1 tbs nut paste - I used almond and chia but it could equally be peanut or cashew nut or whatever you have. Pour it over the flour/sugar mixture. Lightly beat one egg and mix through. Then add in 1 cup of dairy free chocolate chips. I used Sweet William. Drop spoonfuls onto baking paper on cookie trays and bake at 180C for about 15 minutes. Leave them on a tray to cool before transferring to a wire rack. How to get your fussy eater child to try new food, from someone who knows (and why you shouldn't worry too much about it).